This is my first year growing parsnips. I was able to get the seeds to germinate in only 11 days using my shade disc technique (see 11-Day Parsnips). That was downright encouraging. The picture above shows my parsnip bed in early June. You'll notice that I followed the same planting scheme as shown in my Four-Day Carrots video, but I'm growing a single parsnip in each space, not three. 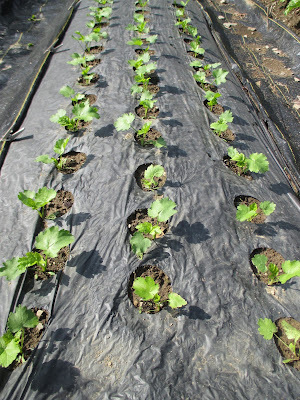 The bed is 30" wide and the planting holes (in the plastic) are 6" apart in the rows. I know that parsnips can be grown closer together, but I wanted to give my first-ever crop of parsnips lots of room. I tend to give plants more room to grow after reading Steve Solomon's, Gardening When It Counts (my favorite gardening book). 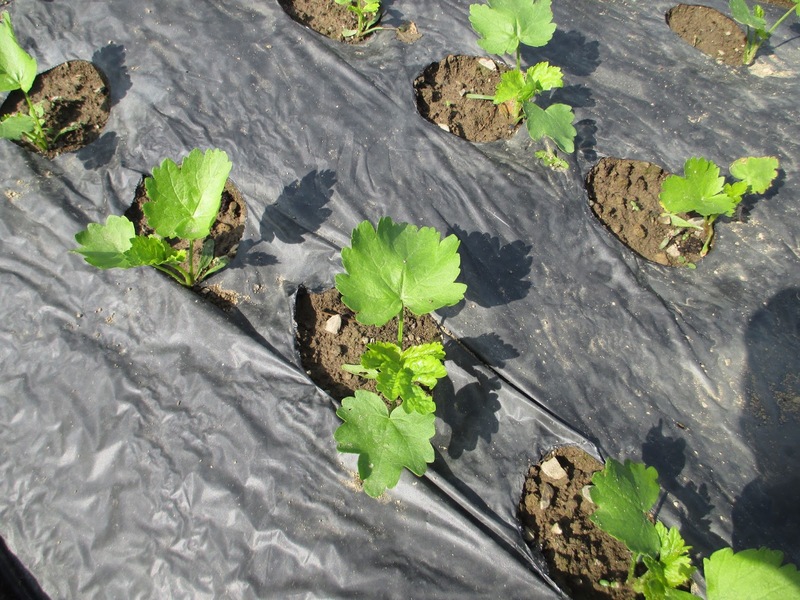 Steve writes in the book that when he started spacing his plantings farther apart, he got better results. A lot of people have been critical of my first Four-Day Carrots video because of my wide plant spacing. They assert that I'm wasting space, and that they can grow a lot more carrots in a similar sized garden bed. While it is true that you can grow more quantity by spacing plants closer together, you don't necessarily get more quality. The proof of this is in Four-Day Carrots, Part 3, where you get to see me harvesting some carrots. Close spacing does not yield carrots of the size and beauty that you can see in that video (and they tasted good too!). The more I use black plastic in my garden, the more I like it. It retains moisture and saves me a LOT of time that I would spend cultivating to keep the weeds from taking over. It translates to greater satisfaction and a better crop. The fact is, everything I've grown using a plastic mulch has grown better than if I grew in bare garden ground. Some people worry about toxins leaching out of the plastic. I suspect that some toxic material may, indeed, leach out, but I'd bet it is very minimal. And the benefits of eating the wholesome, homegrown food surely outweigh any minuscule toxic leaching from the plastic. That's my opinion at this point. I do, however, like the idea of using ramial wood chips as a mulch. Part of the reason I like the idea is that I have a lot of scrubby "weed' trees less than 3" in diameter growing along the edges of my woodland. I want to harvest this invasive undergrowth and put it to good use. So, at some point I will be buying a wood chipper. But I doubt that I'll be harvesting enough ramial chips to cover my whole garden (mulching around my apple trees will be the first application). So black plastic will have its place in my home garden for a long time to come. Hi Herrick, I also have been using the plastic in the garden for about 6-7 years. I used to just cut an "x" where I wanted the seed to go but have since switched to your method with the cans. I use a soup can for the smaller veggies, and a tuna can for the larger one. I also screwed them teach to a four foot by one inch hardwood dowel. Now I don't have be all bent over while cutting the holes. To heat the can I take my turkey cooker burner and put it at the end of the row with a grill tank to power it. Fire it off and keep rotating the can till it is nice and hot, and you can cut 5-6 holes at a time before reheating. Great ideas! Thanks for sharing them here. I just have to say, the bed looks SO much wider than 30". I'm late getting my garden in. I just set up my beds today, just how you have then. Tomorrow is setting up the dewitt fabric and transplanting/planting. We also put our breeding flock of turkey's as well as our meat chickens and turkey poults out on pasture today. Busy day but so gratifying. Neighbor came by while we were digging the beds and commented on how nice they look. Then added it seemed like too much work and wouldn't it be easier to just buy veggies at the grocery or farmer's market? Quick as lightening I stated, "If you don't have control over your food, you are not free." He was momentarily nonplussed. Thank goodness he didn't get offended but I think I got him thinking. His wife has a little hobby veggie garden but spends tons of money, time and energy on flowers and landscaping. Seems backwards to me. I like Mr. Littlefield's ideas. Think I might use them. May I make a request? Would you be able to post a weekly pic of the garden from above? You have done so in the past but I, for one, would love to see it grow thru the season. Pictures can be deceiving. The bed is 30". All my garden beds are now 30". And the walkways are 18". Eliot Coleman uses a 30" wide bed with a 12" walkway. I have made 12" walkways in the past, but like 18" better. Re: the flower-growing neighbor... That was a good retort. I like flowers but I also see a lot of beauty in a nice garden bed of vegetables. You have a lot going with turkeys, chickens, AND a garden too. I'm inspired. We have meat chicks coming in early July. No turkeys this year. I'll see if I can get a roof shot of my garden when the weather clears. It has been rainy for too long here. We had tornado warnings last week and one particularly big storm blew through. A lot of things around my yard were moved by the wind. My pea vines blew off their trellis. But the plastic mulch on my garden beds all stayed put.